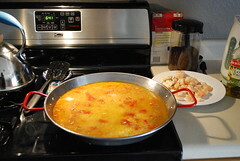 After having it on my mind for awhile, I decided to make the classic Spanish dish, paella, for dinner tonight. Historically, it's a rice dish with random meat and veggies thrown in. Culturally, it's got some serious baggage. 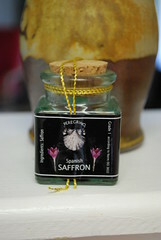 In any case, this now-Texan gringa girl decided to give it a try. 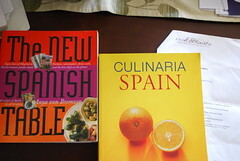 I consulted my collection of Spanish cookbooks, one of them from my dear friend Dr. M-B, and the recipe that we got at the Barcelona cooking class on our honeymoon. 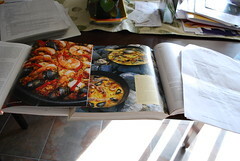 I also read at least five cookbooks and a few online recipes to create my own paella process (if anyone wants it, I'll post it here but on a Sunday night I'm not expending the effort at the moment). Anyway, I had my plan in place and the kitchen was warmly lit by the setting sun as I went to work. Here are some pictures of the steps. 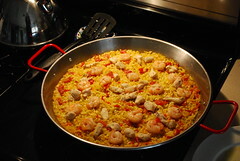 Paella pan, for which the dish is named, was a wedding gift from LeeAnne. The tomatoes came from our garden and the rice is just starting to simmer. Consulting the oracles. Book on left was our wedding gift from Dr. M-B, papers on right came from our honeymoon course. Nearly done! Looks a little sparse without mussels and big prawns but we used a lot of what we had on hand. It tasted great!